New listingNissan Sunny N13, brake master cylinder repair kit, E13 E16 engines, new. New brake master cylinder repair kit, N13 eight valve engine models, 86-89 model years. DATSUN SUNNY. FITS NISSAN SUNNY ESTATE. BRAKE MASTER CYLINDER KIT NISSAN PART NO : 46012-R0255. 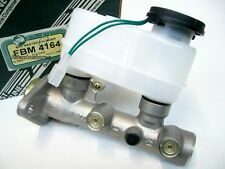 MASTER CYLINDER REPAIR KIT NEW IN ORIGINAL GIRLING BOX. 1 AVAILABLE. BORE: 3/4". Moprod pt no MBR802. Nissan Sunny 120Y. (B310) saloons Tokico cylinder 1978-82. 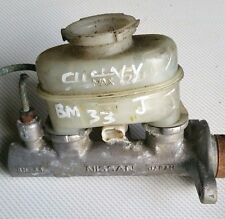 NISSAN SUNNY B13 (1990–1993) Master Brake Cylinder. Brake Master Cylinder from JAPANPARTS. Brake Master Cylinder JAPANPARTS. NISSAN (4601059A00). ONLY ONE AVAILABLE! Use number. Number of Thread Bores OVERVIEW OF THE PRODUCT. Number of order. Cherry / Pulsar- 1.5 ET Turbo. Cherry - 1.7 diesel. Genuine Nabco Brake Master Cylinder. Fits only the specified vehicle models. - Early style cylinder with oblong (not later round type) reservoir. Any given vehicle may have a production run longer than the dates shown, the dates given are usually specific to the part listed fitting the models shown. Moprod pt no MBR803. Nissan Sunny 120Y. (B310) Saloons. Nabco Cylinder 1978-82. Brake System : NABCO/TOKICO. Weight [kg] : 0.16. NISSAN 46011-63C25. Brake System : NABCO. Weight [kg] : 0.96. NISSAN 46010-59A11. NISSAN 46010-59A01. Brake System : NABCO/TOKICO. Weight [kg] : 0.64. NISSAN 46010-04B10. NISSAN 46010-04B05. Part No:Moprod MWR543. To Fit: Nissan Cherry (1982-1991). Nissan Cherry N12 1.0,1.3, 1.5, 1.5Turbo, 1.7D 82-86. Rear Wheel Cylinder Repair. Changed your mind?. Brake System : NABCO. Weight [kg] : 0.15. NISSAN 46011-58Y25. Brake System : NABCO. Weight [kg] : 0.15. NISSAN 46011-57Y25. Brake System : NABCO/TOKICO. Weight [kg] : 0.13. NISSAN 46011-04B28. NISSAN 46011-04B27. Brake System : TOKICO. Weight [kg] : 0.15. NISSAN 46011-01B28. NISSAN 46011-01B27. Brake System : NABCO/TOKICO. Weight [kg] : 0.82. NISSAN 46010-73R20. Brake System : NABCO. Weight [kg] : 0.22. NISSAN 46011-29R25. For over 20 years, JapanParts has been one of the leading providers of spare parts of Asian manufacturers. Their extensive product range includes filters, hydraulics, dampers, clutches, pistons, cylinder heads, bearings, starters, alternators plugs & more. They continue to lead the way with affordable innovation.Japanparts select the best producers of components to ensure performance and durability.They may use other manufactures & brands for their items which are fully covered under Japanparts warranty. 8 x Carbon Fiber Style Vortex Generator Shark Fin Spoiler Wing For Auto Car Roof. 8 Pcs Universal Car SUV Roof Decorative Vortex Generator Shark Fin Spoiler Wings. Racing Brake Clutch Master Cylinder 0.625 Bore Thread Hydraulic Handbrake Pump. 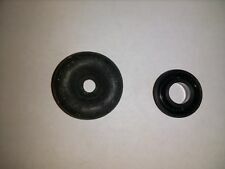 1x Repair Kit for 1 brake master cylinder. AUTOFREN SEINSA. Part Number:D1385. Be aware that each model of vehicle may have a choice of few different part options. Such variations can apply due to upgrade designs on later chassis numbers, or the manufacturers using different OEM suppliers during production process. N14 Y10 B13 GA16DE GA16DS GA16DEL. Brake System NAB-TOK. Use engines info and vehicle YMM compatibility chart for general guide. Strictly important to provide VIN along with your detailed request since there can be different options for your car specific tech characteristics. B11 E15S CD17 E13 E16S E16I A.B.S. 53431 AUTOFREN SEINSA D1372 D1393 ERT 200103 200380 FRENKIT 120046 120074 NISSAN 46011-34A29 46011-34A25 46011-56A90. Manufacturer Part Number 200103. Brake System NABCO. Manufacturer Part Number 200380. B11 AB E15S CD17 E13 EA81 EA65 EA71 A.B.S. 53431 AUTOFREN SEINSA D1372 D1393 ERT 200103 200380 FRENKIT 120046 120074 NISSAN 46011-34A25 46011-34A26 46011-34A27 A178352A 46011-34A86. Nissan SUNNY I (B11) 1.3 1.3 L / 1269 cc 1982.03 - 1987.09 44 Kw / 60 HP. Nissan SUNNY I (B11) 1.5 1.5 L / 1488 cc 1982.03 - 1986.10 55 Kw / 75 HP. Nissan SUNNY I (B11) 1.6 SLX 4x4 1.6 L / 1597 cc 1986.07 - 1988.10 62 Kw / 84 HP. (2015 RAM 1500 with projector-type, high beam. 2004 Ford F-150, high/low beam. For example a)Compatible List can not show up all Car model. Material Type: STEEL. Item Type: Engine Care. Products can be wholesale! Part Manufacturer:ABE C81510ABE. Brake hose flexible rear (length 308mm, F10x1 / F10x1) L / P NISSAN 300 ZX, LAUREL, MICRA I, PRAIRIE PRO, SILVIA, SUNNY II, SUNNY III 1.0-3.0 12.82-05.95. WE ARE OPENED MON. Brake Proportion Adjustable Prop Valve Brake Bias Adjuster Knob Type. Inlet & Outlet ports are 1/8NPT industry standard size for brake lines. We will reply you within 24- 48 hours. Suitable for motorsport use. 3/8" Universal Car Disc Brake Piston Caliper Wind Back Cube Tool AT2134. To remove and install Disk brake piston. Rotate piston back into cylinder. Re-aligns piston slots (where applicable) to back of brake pad.